Geared to readers from preschool to age eight, What Makes a Baby is a book for every kind of family and every kind of kid. It is a twenty-first century children's picture book about conception, gestation, and birth, which reflects the reality of our modern time by being inclusive of all kinds of kids, adults, and families, regardless of how many people were involved, their orientation, gender and other identity, or family composition. Just as important, the story doesn't gender people or body parts, so most parents and families will find that it leaves room for them to educate their child without having to erase their own experience. 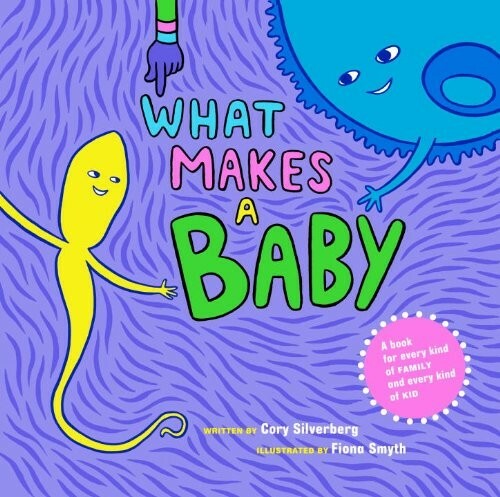 Written by a certified sexuality educator, Cory Silverberg, and illustrated by award-winning Canadian artist Fiona Smyth, What Makes a Baby is as fun to look at as it is useful to read. For more books for young children about human reproduction, visit A Mighty Girl's Anatomy & Physiology section.